He was a replica from out of the past. I first noticed him late one Autumn afternoon as I was preparing to play a few holes before Dusk. He had just taken a few practice swings as the foursome ahead of him was playing its second shots when he noticed me leaving the putting green. I assumed he would play alone because his ball was already teed, but he gave me a peremptory smile and motioned me to come ahead. "You might as well play along, son, it's getting late and we can just about squeek in before dark. My name is Adam." I have remembered him clearly from that moment. He was clad in a baggy, tweed jacket and wore the traditional plus-fours with the Argyle socks to match. His black, shiny boots could only be described as Brogans, and on his head was the characteristic panelled cap with the small visor. He could have easily been mistaken for James Braid. I never really knew if that was his first name or his last, but it didn't matter. To a young lad of thirteen who had just taken up the game, he was the Adam of Golf: he was the predecessor of all later golfers. I had seen a few vague photographs of old-time golfers, but I never thought I would actually behold one - or at least what in all appearances seemed to be one. Adam was a fitting likeness of any I had ever remembered from pictures. When we were ready to hit our second shots to the first green we waited what seemed to be an eternity; the players went about their business of putting as though a million dollars were at stake. "They're playing for 'skins'; it's a gambling game. Whoever wins the hole wins a 'skin'. I'm interested in golfing history, and I read an account of its origin". "Well, what is a 'skin', " I mumbled, "and why do they call it that? I've never heard of them." "A 'skin' is a hole won by a gambling golfer in competition with others. They all have to pay him an amount specified at the start, and that amount is doubled and tripled and quadrupled on each hole that is halved. They can win a lot." "But why is a hole won called a 'skin'?" "Well, according to one of my sources, it all started at St. Andrews centuries ago. Fur traders from other countries would stop at seaport towns and sell furs to the furriers. When they came to St Andrews, instead of going straight into port they would anchor offshore, row in, and play the eleven holes over The Old Course from the sea to the town. To make it interesting, they would meet the furrier at the shore, play in together, and gamble along the way. Since they were both dealing in furs, they would play for those on the basis of who won the hole. They played for 'skins'". "And I guess that game has been played ever since," I mused. "Why don't you play it?" "I guess because I am a purist. I play golf for the satisfaction I derive from making a good swing - not for any dollar value placed on a low score. If you swing well you play well; if you play well you score well, and if you score well you feel well. What more do you need?" His philosophy of golf certainly could not be questioned. I learned a great deal from Adam that day decades ago - and I haven't forgotten any of it. The game has changed a great deal since then, and so has the playing for 'skins'. But it is still as popular as ever for winning money. Indeed, it has an interesting history. The 'skins game' has gone from seaport furriers to weekend amateurs to public links hustlers to touring professionals, and that is where it is today. It started in 1983 on Thanksgiving Weekend and it has been played every year since. The first four players in the Skins Game - as it is now referred to - were Arnold Palmer, Jack Nicklaus, Gary Player, and Tom Watson. And guess what? For the Skins Game of 1996 it will be again Tom Watson . . . with Fred Couples, John Daly, and Tiger Woods. Talk about "the swing is the thing", these guys are all swingers - no hitters or punchers or choppers - and their swings are a satisfaction to any golf purist. But they're not playing for each other's money; that is provided by the tournament sponsors! And they are not playing for pelts. The pay off is $20,000 for each of the first six holes, $30,000 for each of the middle six holes, and $40,000 for each of the last six holes. With that kind of money available, no wonder plus fours are only worn by purists. (I keep mine in the closet). This year's "action" will take place at the Rancho La Quinta Country Club in Palm Springs. It is a Robert Trent Jones Jr. creation, and it has been much acclaimed: "Sheltered by the majestic back-drop of the Santa Rosa Mountains, the golf course emerges effortlessly from the desert topography. Graceful dunes give rise to mounds, bunkers, and dramatically sloping greens - challenging players at every level to an endless variety of shots. Lakes, waterfalls, and citrus groves add visual interest, requiring careful shot-making strategies." I think those guys will need more than six or seven clubs. Set in a spectacular environment, the course poses many interesting options. 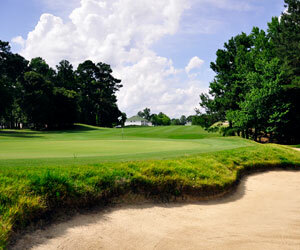 The finishing holes are great examples: "With an uphill approach, (16) plays slightly longer than it reads. The tee shot must avoid a large lake and fairway bunker, (and) a long iron is required to an elevated, sloping green surrounded by mounds and swales. Playing downhill across a lake, seventeen is a dramatic and challenging hole. The green surface has noticeable contours lending itself to interesting breaks. Well positioned tee shots may lead to a birdie opportunity. A waterfall forms a spectacular backdrop to one of the most dramatic finishing holes in golf. Long hitters will be pleased to find an absence of bunkers. Those hitting the green in two will be rewarded, but missed shots will find tragedy. With its breathtaking scenery and masterful design, the rolling desert certainly sets the stage for an extraordinary golfing experience. The Skins Game: a bit of golfing history that's still in the making. Enjoy the Executive Package in Santee, South Carolina! 2 rounds of golf with cart at Santee National Golf Club and Orangeburg Golf Club.